AP SSC/10th Class Exams Time Table for March 2019 Public examinations, bseap.org Exam dates . AP SSC/10th Class March 2019 Public Exams Time Table. AP SSC/10th Class March 2019 Public Exams Time Table . bseap ssc 2019 time table, Directorate of Government Examinations, 10th SSC Public Exams March 2019 Time table, schedule, Andhra Pradesh School Education Exams Schedule , SSC Public Exam Hall tickets Download , SSC Supplementary Exam Dates, AP 10th Class Students Annual Examinations Schedule. The Board of Secondary Education, Andhra Pradesh state government has announced the Secondary School Certificate SSC Public examinations tentative time table for the year 2019 to be conducted in the months of March/April 2019. AP School Education Board conduct 10th Class Exams in March 2017 .The Board of Secondary Education has clearly indicated that the students of the entire Andhra Pradesh state may have follow the same methodology. The SSC Public examinations will be start from March 3rd week including other exams.All examinations will be held from 9.30 AM to 12.15 PM. So, all tests would concluded in the April month in AP state. Who are studying 10th class to attend Public Exams Timetable download in Official website bseap.org. BSE Andhra Pradesh Class 10th Board Exam Time Table has been released by the Board of Secondary Education, Andhra Pradesh (BSEAP) on its official website today. The board has notified that the annual examination for the SSC, OSSC and Vocational students will be conducted in the month of March 2019. 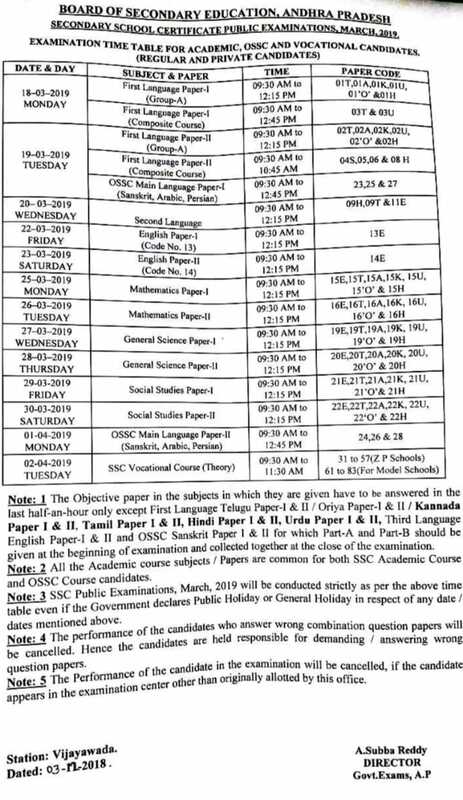 April 03,, 2019 - English Paper I.
Read➧TS SSC/10th Class March 2019 Public Exams Time Table. Read➧TS Inter March 2019 Public Exams Time Table. Read➧AP Inter March 2019 Public Exams Time Table.